This home in East Vancouver was built in 1979. The roof was original, and was ready to be replaced. 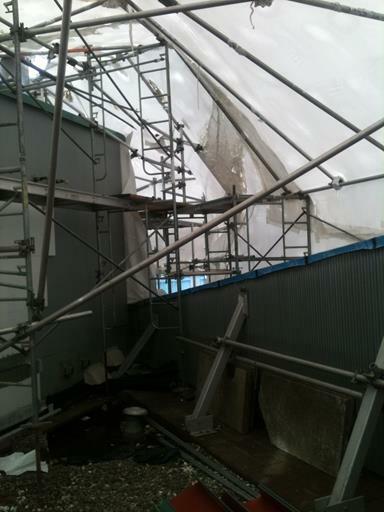 The roof exhibited some signs of failure such as blueberry blisters, ridging, and blistering. 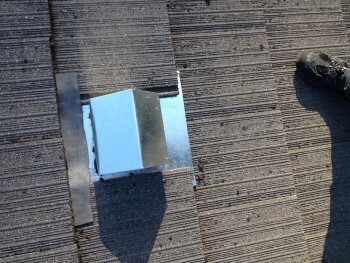 The video explains some of these issues as well as giving a good look at some failed chimney and roof flashings. The buyer negotiated thousands of dollars off the purchase price! How Long Does Our Home Inspection Take? This is a common question from clients. Our home inspections usually take about 2 hours for a condo and 2.5 to 4 hours for a townhouse or house, as well as the time spent writing and finishing the report (on-site). Why does a good inspection take time to do properly? There are many factors that can affect the time when performing a thorough home inspection, such as the size of the home, (the larger the home, the longer it takes for the inspection); the age of the home (older homes may take longer as there are potentially more issues that may be present); complexity (such as, number of electrical main and sub panels, water softeners and filters, pools and spa); and the condition of the home; if the home is in good repair then it won’t take as long. Another factor may be whether or not the home has been a rental property, as rentals may be neglected. Weather conditions such as snow, rain or intense heat can also add to the inspection time. How can I make it easier and quicker for the inspector? 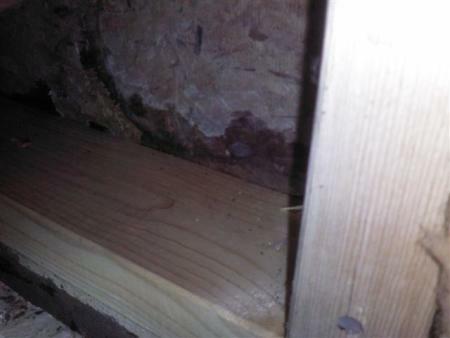 The inspector needs access to all the areas of the home, such as the crawl space and attic. Making sure all utilities (gas, water, electrical) are on will ensure no down-time while we de-winterize the plumbing or search for the electrical disconnect. Home owners generally have questions or concerns about the condition of their home, which I like to fully address while we are on site – this also adds to the time factor. If you have any questions, the end of the inspection is the best time to ask! Can I Follow the Home Inspector? Q: I Have a Home Inspection booked with you. Can I join / shadow along on the inspection? A: Of course, it’s a great learning experience. I encourage our clients to attend if possible. It’s always a great idea to hire a professional home inspector whether buying or selling a home. There are a huge number of things to consider and understand. Joining along on the home inspection will give you a better understanding of how potential defects will affect the value of your home, whether they are serious or relatively minor, and also what it would cost to do repairs. We will also help you learn about the maintenance and care of the house. We encourage you to take notes and photos and ask questions although, of course, we also will provide you with a digital Home Inspection report (including photos) at the end of the inspection. And don’t worry – if you can only make the end of the inspection, we will be happy to take you on a walkthrough of the home and the issues we found. Upon entering the attic, it was clear that there was a problem; in the photo below, we should be seeing the bottom of a vent, not concrete. TIP: Turn off your flashlight in the attic. Do you see daylight? You should, but only at the eaves (soffits) at the lower edge of the roof, and the roof vents. If you see daylight anywhere else, it may be a leak waiting to happen. The underlay had been cut, but from below, only the bottom of the concrete tiles were visible. No roof vents. After going outside to measure, then back into the attic, it became clear that the original installers had misaligned every roof vent. This attic had no ventilation! Even more surprising? The house was built in 1998. It had been that way for fifteen years! UPDATE: I returned to this property a few days ago, and the seller had called a roofer to install new metal roof vents. And this time, they were properly lined up! The buyer who hired us ended up saving about $2000. UPDATE AGAIN: Some neighbours nearby spoke with the sellers, and noticed that their attic vents were also missing. They are currently working on repairs. If you suspect mold in your home, there may be a number of reasons – a damp or mildew odor in the home, visible mold growth, or health problems (coughing, headaches, nausea). In obvious cases, you may be able to see the mold, however most of the time it may be hidden. Plus, not all mold growth is visible. A wall may be covered in mold and you may not notice. When moisture conditions are right, mold can begin growing in 24-48 Hours. Once the mold begins reproducing, spores will be released at 10-14 days after the initial growth. Mold spores can be breathed in and cause multiple health problems. 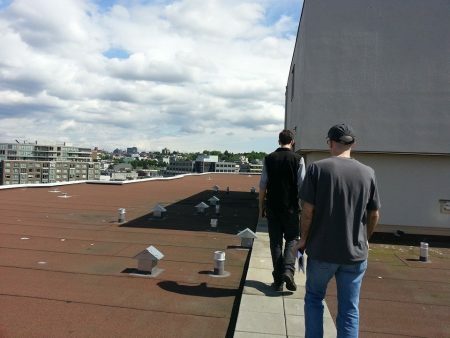 …So How Can We Detect Mold Spores? 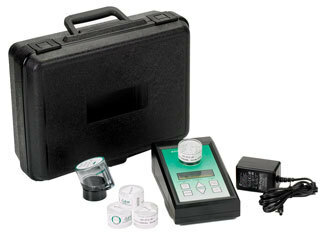 An Air Quality Test is the ultimate tool in mold detection. By pumping air through a spore trap, we can capture floating spores. These traps can then be taken to a lab and analyzed for certain types of spores. 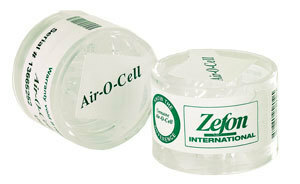 Air Quality Testing is extremely fast – in as little as 30-45 minutes, we can take all the air samples we require. What Report Do You Receive? We provide a certified Lab Report with a breakdown of the exact genus of Mold found in the home. The report is extremely detailed and we help with interpreting your results. We inspected this home in the Cloverdale area of Surrey, BC. Like many homes built in the 1980’s in this areas, the front of the home featured a brick veneer wall. Brick veneer walls are excellent, if they are installed well. Generally, the design sheds water through a drainage cavity behind the brick, and out through weep holes along the bottom course. However, this wall had a few problems which were causing leakage. 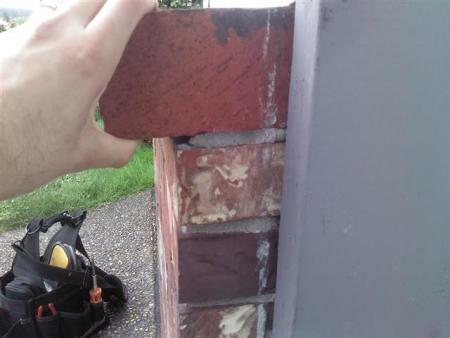 This particular wall had been damaged mechanically and was cracked in multiple areas. Cracks and damage almost always lead to water intrusion. Several bricks were loose and falling off the wall. 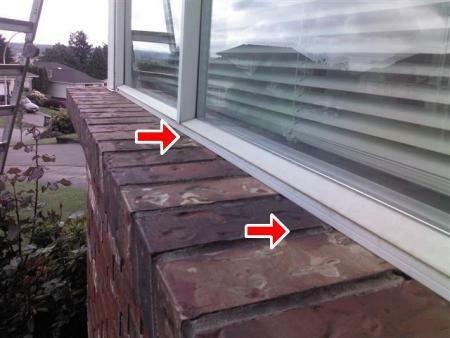 The soldier course window sill was poorly flashed and directing water into the wall cavity. Sealant should have been installed here to prevent water damage. The front garden bed soil was piled above the bottom weep holes. A blocked weep hole can cause moisture to be held in the wall cavity, and contribute to rot and decay of the wall sheathing or framing. Inspecting from the crawlspace, we removed some insulation from the back of the wall. 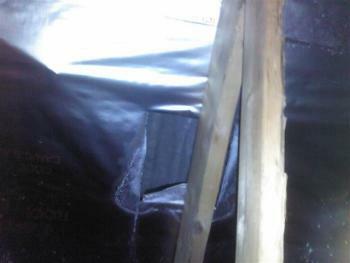 Here we can see rot of the OSB (oriented strand board) sheathing. 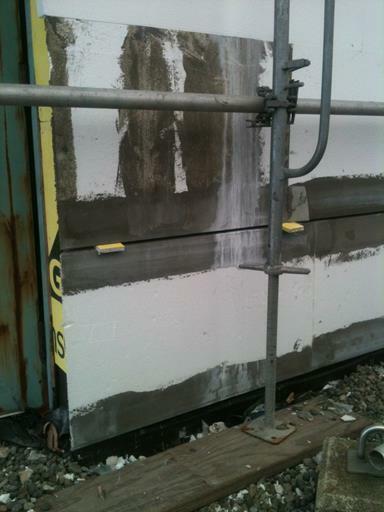 Moisture damage was evident from both the top and bottom of the wall. 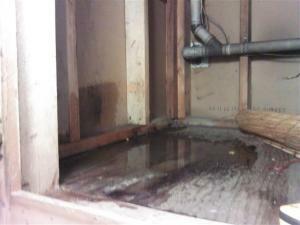 This house in Langley was inspected about a week after a huge rain storm. Around the exterior I found a number of downspouts that were either broken or directing water against the side of the foundation. 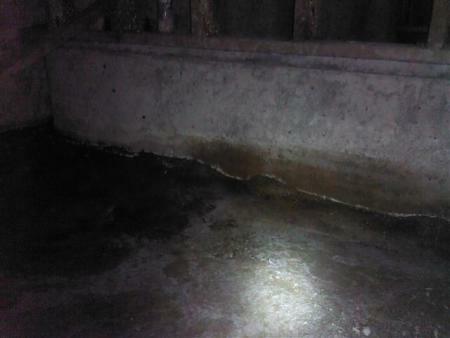 This condition seems minor, but it can be the difference between a wet and dry basement. 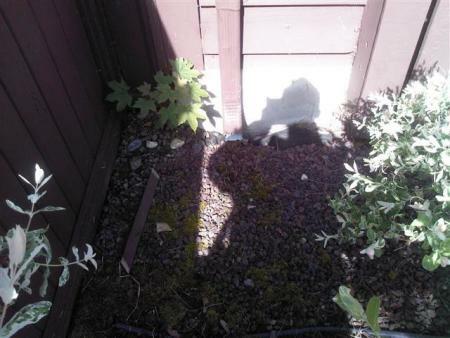 I recommended the owner extend the above downspout away from the home by six feet, or install a splash-block to divert water away from the foundation. When we entered the crawlspace, there was a some insulation lying on the ground that was wet – a big red flag. Even seven days after the last rainfall, there were still several inches of standing water. I also found a large (1/4″) crack in the concrete foundation wall which appeared to be moving, probably due to the water ingress issues. Wet basements can be caused by poor drainage, bad grading (slope of ground above), underground streams or high water tables. In this case, we discovered that the home originally was designed to have a full basement, but was changed to a half-crawlspace due to city restrictions. 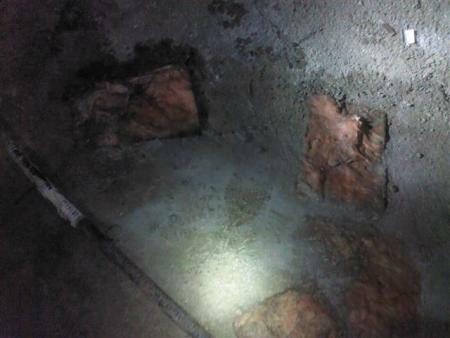 However the buried perimeter drains in the basement area were kept at the crawlspace depth, well above the footings. Water was seeping in below the drain tile. The client saved a considerable amount of money by having a quality home inspection performed, prior to purchase. This townhouse inspection in Vancouver was in a newer development, and the unit was occupied by a large family. It was also home to one of the worst cases of mold growth I’ve ever come across. 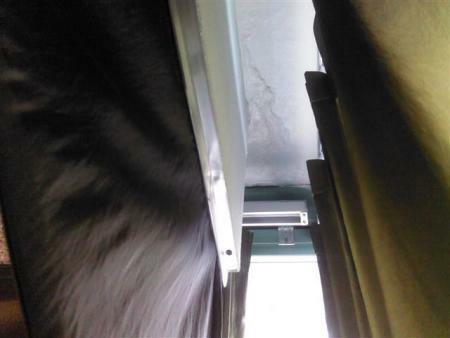 As soon as I arrived I noticed the moisture on the inside of the windows – a warning sign of poor ventilation. 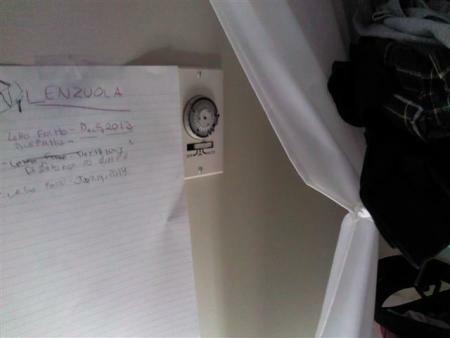 A bathroom fan timer can often be found in a closet or laundry room. Condensation and humidity levels in the home were very high, and mold growth was found on the walls and windows. 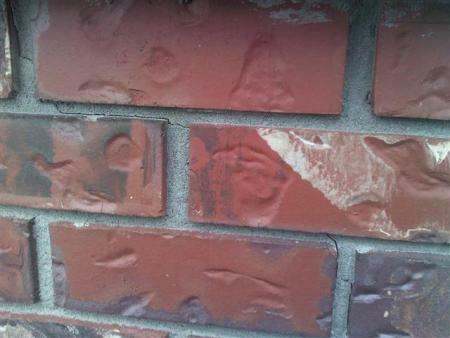 Thermal imaging (below) showed extreme levels of condensation at the colder exterior walls. 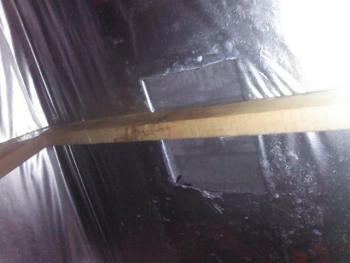 This bay window was soaked with water and growing black mold. 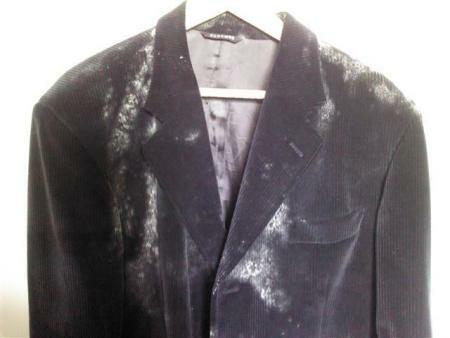 That white powder was thick mold growth, which covered most of the clothes in the closet, and several pillows, blankets and the carpet. The owners had to perform a full mold remediation of the home, and dispose of many personal belongings. They also had to remove and replace some affected drywall. Always run your bathroom fan according to the builder’s directions! Among the most “called out” items from my inspections. If you’re going to wire up a receptacle, or add a light fixture, make sure it’s done to current standards. The inspector is going to test the outlets and look inside the panel, and if something is wired wrong, he’s going to find it. When he reports it, it will likely be in bold letters with the words “Safety Hazard” on it. This scares the heck out of buyers, even if it’s an easy repair. Fix all leaking sinks and faucets. If you’ve done “DIY” plumbing, have a plumber come and bring it up to code. Nothing makes a nice house look shoddy faster than a leaking sink. Even worse, if a drain trap is installed incorrectly, the inspector will write it up as a safety hazard. If you have an old roof, or a chimney that’s been leaking every spring for the past four years, make sure to let potential buyers know about it before the inspection. You may know the history of the roof, but the buyers may be surprised when the inspector points out a prior repair. 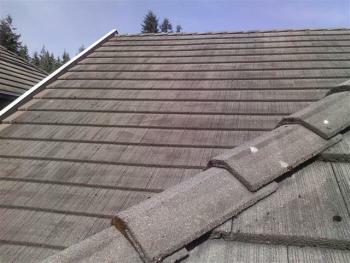 In our area, a new roof can easily run $10-15,000, and the buyers may automatically assume the roof needs replacement, even if it just requires some new flashings. Before you sell your home, look in the attic. Is there any visible mold or moisture damage? Check the entire attic for nests, mice or rat droppings. If you have bathroom fans, make sure they’re not spilling hot air. Attics can be a scary, mysterious place for a first-time home buyer, and the issues affecting them are often misunderstood. 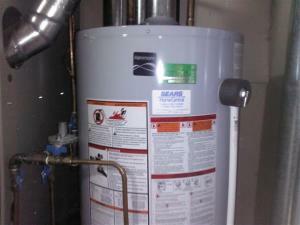 A hot water tank usually lasts from 8-12 years. Check your tank age before the inspection. If it’s 20 years old, the inspector may recommend replacement. This is an easy issue to prevent – a new tank is fairly inexpensive, and you can advertise a new tank as a feature on your MLS listing. Here we are at the rooftop. The building was 24 stories and full enclosed in scaffolding. During our visit the building was in the final stages of the project. The wall assembly was on full display. This wall’s cladding, when finished, will consist of Georgia-Pacific DensGlass sheathing, a rainscreen cavity, expanded polystyrene boards, and stucco base and finish coats. 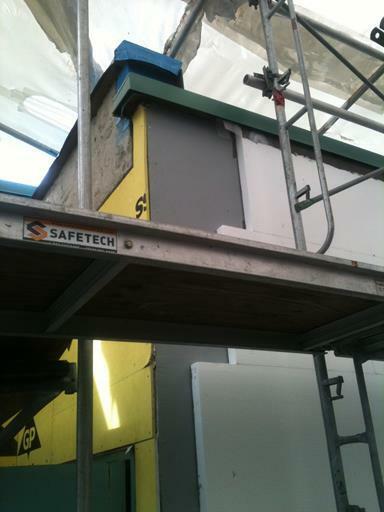 Stucco over polystyrene boards is better known as EIFS (Exterior Insulated Finishing System). Here the sheathing installation has been finished. The yellow boards visible are the DensGlass. A photo of a balcony. Part of this project involves re-coating all balcony surfaces with a liquid-applied traffic coating (similar to parking garage membranes). 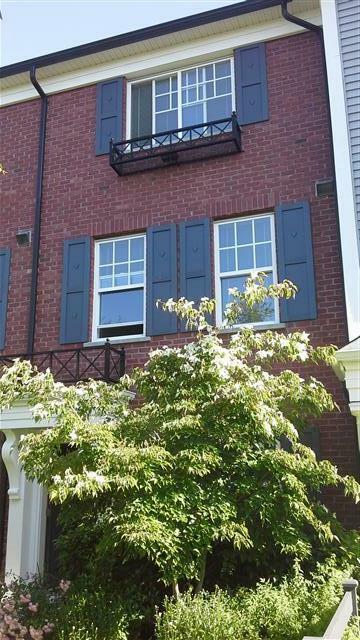 When the EIFS siding was originally installed in 1994, it was installed without a rainscreen. 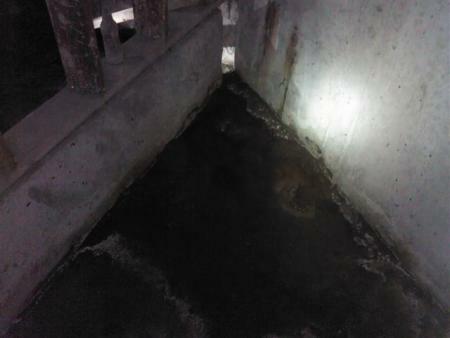 This led to water becoming trapped behind the cladding and seeping into the suites. 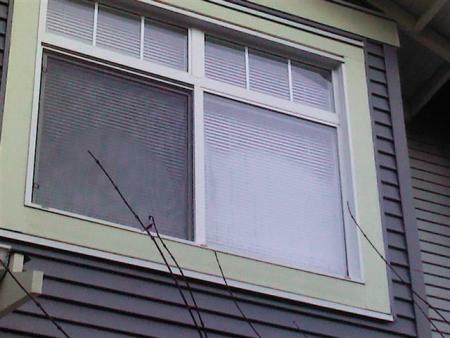 This new rainscreen installation should perform much better. Leakage stains visible in one of the suites. 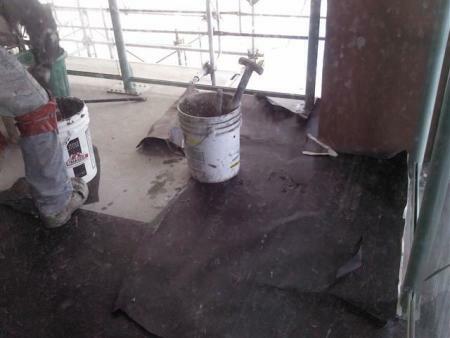 Although dry now, this suite had a number of moisture/seepage problems prior to the repairs. Even the flooring was damaged! 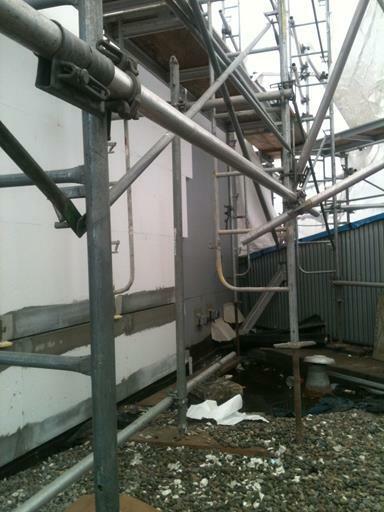 When the project is complete, it should provide a long-term, quality solution to the leakage.